"Like" token, awarded by akosiaris. Currently we rely on manual testing and user reports to notice if a MT service is not working. This is not optimal. External service fails with a specific content. External service is down or too slow. With automated monitoring (with alerts) we cannot capture 1, but we can at least immediately see if it is 2 or 3 and investigate more. Errors are logged with minimal details (HTTP status code, language pair) to LogStash. We can only get WMF hosted services (ie Apertium) stack trace properly. No alerts or overview over time. CX could internally ping the services with a fixed request and log response time / failure state. How to get alerts? Where to log? Can we graph it? CX could introduce a new api "ping" that can be used to check service status without authorization. The API only returns up/down and maybe response time. We could also try to directly ping the APIs, but without keys, we would only know if service is unreachable. KartikMistry added a subscriber: akosiaris. KartikMistry moved this task from Backlog to General - MT Services on the User-KartikMistry board. 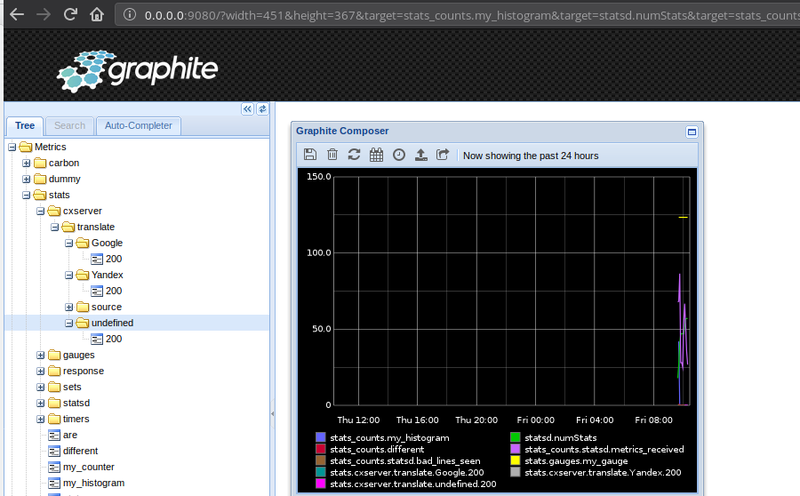 As illustrated in above patch, cxserver has metric reporting capacity already. We just need to emit appropriate counters to track errors or success. In production if cxserver is configured with statsd, we can monitor the services(actually anything in cxserver) using grafana.wikimedia.org or any graphite dashboard. is ready since a very long time ago. All required is to instrument the code with the interesting parts and create dashboards. KartikMistry moved this task from Backlog to In Progress on the Language-Team (Language-2018-October-December) board. KartikMistry removed subscribers: Stashbot, gerritbot. KartikMistry added a subtask: T121404: Monitor the status of the Apertium services for ContentTranslation. KartikMistry added a subtask: T121405: Monitor the status of the Yandex services for ContentTranslation. KartikMistry added subscribers: Pginer-WMF, Amire80. Arrbee closed this task as Resolved. Arrbee assigned this task to santhosh.